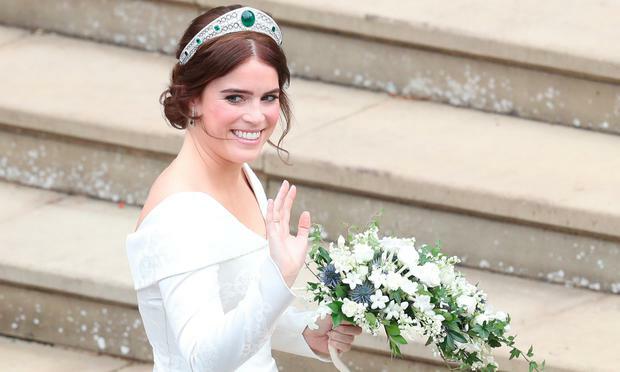 When Princess Eugenie emerged from her car outside St George’s Chapel at Windsor Castle on Friday, there was a gasp of admiration for her damask satin Peter Pilotto gown. She was every inch the picture-perfect princess, but there was something even more powerful at play — her dress was deliberately low-cut at the back, revealing scars from her scoliosis surgery. With one gesture, Eugenie had rewritten the royal rules. And later on, her romantic evening dress, a pale pink pleated silk Zac Posen gown, won further praise for its elegant simplicity. It was a day where the younger daughter of Sarah Ferguson and Prince Andrew, who has frequently been on the receiving end of negative headlines, got everything right, and proved that it’s not just Meghan and Kate who are entitled to the royal fashion crown. It’s all a far cry from the 2011 wedding of Prince William and Kate Middleton after which Eugenie, and older sister Beatrice, ended up on countless ‘worst dressed lists’. That was probably a line in the sand for the young princesses. Eugenie reached out for professional help and wardrobe advice. So by the time she started planning her wedding to Jack Brooksbank, the Princess had a secret weapon up her sleeve — Irish born A-lister stylist, Sarah Price. While Price is famously tight-lipped about her clients and work, it’s become widely known in fashion circles over the past four years that Eugenie has developed a close relationship with the Irishwoman. Price is the fashion dynamo behind Style Tonic, a referral-only luxury styling and wardrobe management service with an A-list clientele which has been reported to include actress Gywneth Paltrow and singer Kylie Minogue. Born and raised in Dublin, at the age of just 19, she moved to London to pursue a lifelong love of fashion. But don’t let her 5ft 2in petite stature give you the wrong idea — this woman is a formidable fashion powerhouse who studied at the prestigious Fashion Institute of Technology in New York. I caught up with Sarah at her London office where politely but firmly, she made it clear she was not going to discuss her clients. She was, however, happy to discuss how she gets the best out of the women she works with. “For me, the job is go in and make their aesthetic their own, and then exit stage left. Nobody ever needs to know you were ever there,” she says. “How I work is to simply get under the hood of the woman’s personal style, draw that out of her, work on the best compositions for her look and then let her have all the credit and let the moment be hers. It’s abundantly clear she doesn’t approve of ‘dependent’ styling relationships. “I work collaboratively with women with amazing taste and we work together on every aspect of their wardrobe, and that’s why all my women look like themselves and individual, and not a ‘copy-paste’ of one look or aesthetic. “We dive deep into the periods of fashion and distinctive silhouettes she loves, and the aesthetics that suit her. And we draw and build on that. “When all my women are sitting front row together at a fashion show, and when l have three or four of them on a red carpet, you’d never know they are dressed by the same person and that’s really important to me. While it is not her job, Sarah says she does act as a conduit linking clients with designers and her aim is to make her women independent in the process. “We work closely with different women and it is really about coming up with a strategy. Your clothes are a business card you are handing out before you even speak. They are speaking for you before you say anything, so you want to be intelligent about that, and not just put things you like on your client. It is a more considered approach, Sarah adds, and the results speak for themselves. She frequently spends time with not just her clients, but their families, managers and agents, to get a real sense of their lives. It is not about simply choosing one dress or one look, but formulating an enduring fashion plan which will let the woman’s sense of style develop and reflect their personal and professional ambitions. Recently, she Instagrammed a look from fellow Dubliner, Simone Rocha, after her London Fashion Week show. Simone is a designer Sarah uses a lot with her clients “because there’s an intelligent femininity to what she does and as a designer, she multi-layers so many aesthetics really well”. As for Sarah’s own wardrobe, she says she has a huge amount of vintage from the 90s and Noughties, including Alexander McQueen, Tom Ford and John Galliano. Overall, Sarah’s styling message is of confidence building and elevating your personal look.